Final Fantasy XIV is a big game. Maps are separated by loading zones, so Eorzea doesn't feel quite as open as, say, Azeroth, but there's a lot to do. There are 60 dungeons and nearly 50 trials, and, thanks to the roulette system, these all get run almost every day. 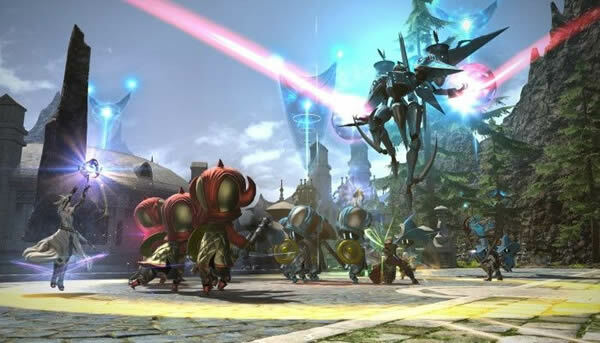 Final Fantasy XIV's story reached a climactic point during its recent Stormblood expansion and according to main scenario lead writer Natsuko Ishikawa and localization lead John Crow, it's far from over. Ishikawa also suggests that its direction might not be exactly what you'd expect from a Final Fantasy story. "It's interesting because Square Enix games tend to always have this sort entity like an empire, fighting against an empire, or something similar," he said. "I've played a whole lot of Square games throughout my childhood and I feel that I've absorbed those different games through my early formative years. That being said, I've added my own twist to things in Final Fantasy XIV." But that doesn't mean that there won't be references to series classics, or even other Square Enix games. You might actually see a reference in Stormblood somewhere in the Doma region. Also, in the Omega raid, you'll see some Final Fantasy VI. The story is already mapped out well in advance, although the pair wasn't able to confirm whether the next story progression will come in the form of a patch update or official expansion. No matter what direction the story goes, Ishikawa and Crow are determined to maintain continuity as much as possible, taking care to always be aware of story elements established in the past. Meanwhile, if you need some Ffxiv gil, you can visit our website.